The Easter holidays brought with it the end of Amy second term of swimming lessons with Puddle Ducks. Our two terms of Kickers lessons have been very difference despite them both being the same level so to speak. Amy’s second term saw us remain at the same venue but change the day of her lesson along with the time and her teacher. This was purely because it fitted more comfortably with the rest of our week however it seemed to have quite a dramatic affect on Amy’s attitude to her lesson. She was more confident and more prepared to give things a try. Amy has been something of a monkey over the course of the last few lessons – I’m not sure if she’s got a case of the “Water Wobbles” or if she’s just being a stubborn two year old, however she’s very clear on what she does and doesn’t want to do. She certainly doesn’t want to go under the water and she doesn’t want to jump in (unless its during Jelly on the Plate and then she’s more than happy to wobble off the float – the cheek of her!) As a result of this, Claire and I were keen that as she moves into Little Dippers after the holiday she should remain with the same teacher, at the same pool. 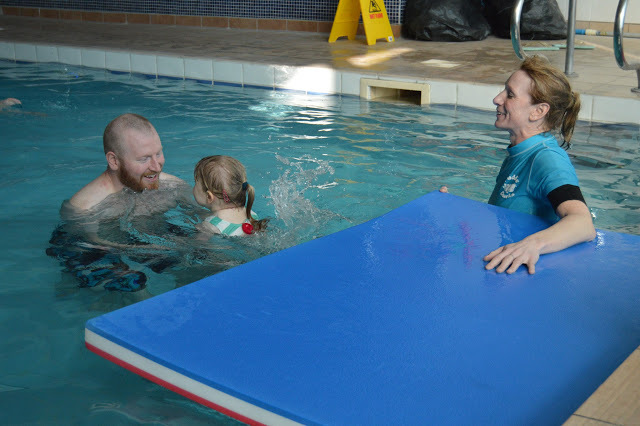 At this stage in her swimming development we both felt the continuity was important for her. I completely trust that Puddle Ducks will get Amy through this phase and that eventually we’ll get her to the stage where she’s happy and confident in the water! 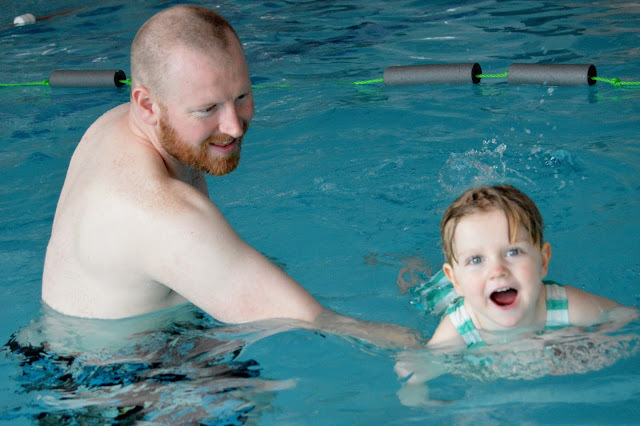 While we were away in Northumberland during the Easter holidays we were able to take the opportunity to swim as a family for the first time in ages. Unfortunately Amy was not at all impressed and wouldn’t even swim on my back which is normally her favourite thing to do. I’m hoping that her insistence on clinging to me like a limpet was more to do with the different surroundings than the start of a full blown case of Water Wobbles . . . we shall see when she starts her Little Dippers class with Claire next week. 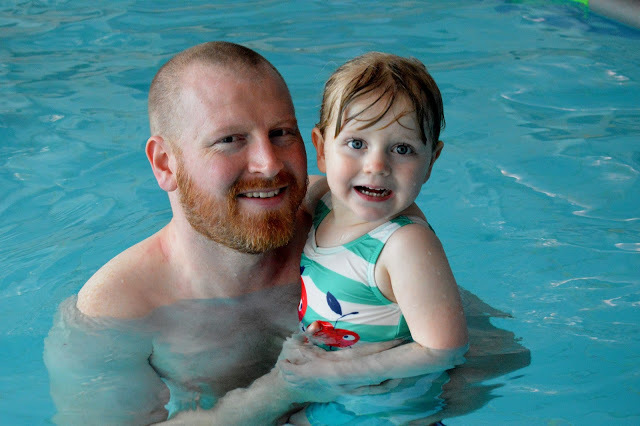 I can’t wait to see how she copes with the changes that come with swimming in an older class – having had little tasters at the end of each term we know that there will be some new songs to learn and some new routines to follow! I’ll be sure to update you soon! 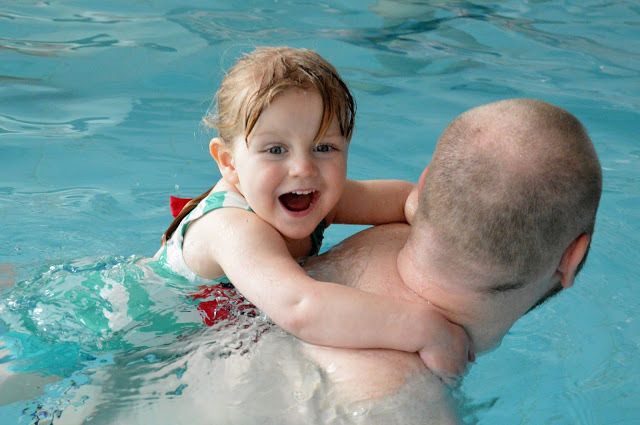 It is wonderful to see water confidence a little ones, She is having so much fun with daddy. Puddle Ducks has clearly worked for you. Love the look of joy on Amy's face when she's on her daddy's back. Hope that the water wobbles were just due to a different pool – glad to hear that she's been enjoying Puddle Ducks and hope that she continues to enjoy it moving up to the next level. Aww! Bless her. It looks like she has been having a lot of fun! Great that Daddy could see the difference himself! We are trying to get our daughter sorted out with swimming lessons. Learning to swim at a young age is a good thing. I find that kids & swimming goes through these patches and all of a sudden they get into it again. 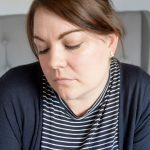 I certainly remember having trying times with my eldest when she was 2 then when she moved up a class she was fine again, I think she needed the more difficult class to hold her attention again. It's lovely you have faith in the school though and I'm sure the continuity will be great for her confidence!